For this Quest to become available you need to be at least level 12 and have a baby in your Sim Town. On completion you will unlock new infant interactions, the musical expression Hobby and more clothes for your infant. If you can complete it within 5 days you'll also unlock the infant Xylophone, which is available from Promotions R Us. Here is the list of things to do in this Quest. She is in the Park on a bench, whistle for a Sim then tap the Nanny. Get the green diamond above an Adult Sim's head then tap the baby. While holding the baby, tap the couch. Get the green diamond over the infant's head, try tapping her to do this. Then select another location in house and tap there, the infant should crawl to where you tapped assuming nothing is in the way! - If there is, choose somewhere else. Switch back to the Adult, then with the green diamond over her head, tap the baby to get this option. Tapped the knocked over garbage can. Tap a bathroom sink to get this option. Select the baby, then tap on the Adult Sum and select the 'Cry for Sim' option. With your Adult Sim holding the baby, tap on a crib and choose the Rock to Sleep option. Head over to a computer to do this. Just tap the infant while an Adult has the green diamond over their head. 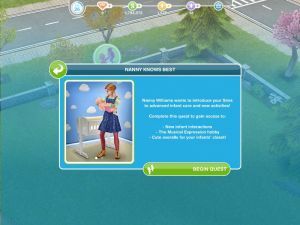 With your highchair accessible from behind, and your Adult Sim holding the baby, tap your highchair to complete this task. Tap the fridge. If you don't have one, get one from the Home Store > Kitchen. Tap your infant that is in the highchair to get this option. The Nanny should re-appear, tap her to get this option. With the baby still in the highchair, and an Adult Sim selected, tap the baby to get the Feed Soft Food Option. Tap on a computer to do this task. And that's it! If you had difficulty with anything in this Quest, feel free to drop us a comment below and we'll see if we can help. why won't it let me put my infant in the high chair? ?